The Universidad Tecnológica Equinoccial had a superb performance to defeat the Universidad Austral of Chile 114-70. 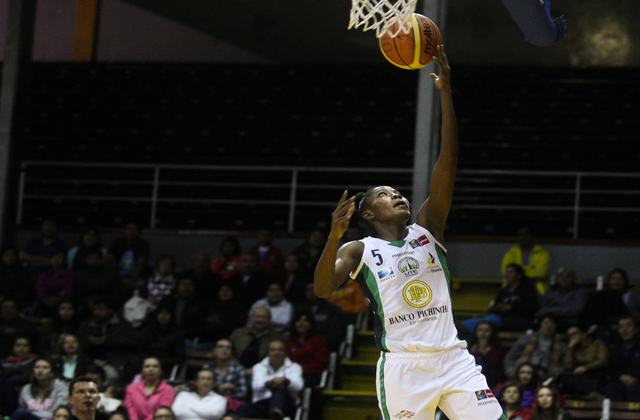 The local team had four players above ten points, the most prominent was Astou Traoré with 31 points. The match started evenly, in which the Universidad Austral assert their attack with the inner game from Ziomara Morrison and Melissa Cejas, while the UTE reached the goal from the three-point line from the hand of Paola Ferrari and Astou Traoré. Until a triple by Lydia Mirchandani gave the advantage to the Chilean team, 9-6, halfway through the quarter. Another shot from long distance from Traoré added to a steal and a fast lay-up by Marjorie Caicedo allowed the team to go ahead, 11-9. Local completing an 11-0 run to take an important advantage (17-9), jumper with just over two minutes to play. The Chilean improved and deducted at closing the distance on the scoreboard and ended the first quarter, 21-17. The led by Andrea Bilbao failed to take the ball to Ziomara Morrison and lost weight on attack, added to that Cejas added three personal fouls, which was used by the local with a 9-0 in to escape to 30-17. Paola Ferrari accompanying Traoré, who already stood as a figure, totaled between both 29 points of the 42 of their own team, surpassing its rival by 19 (42-23). The Local team was far superior to the Chilean, who couldn’t found a way to score. The led by Gorosito went to the long break with a 46-31 win. The home team had a second half in which came out determined to kill off the game, showing time of great basketball level, defending hard and running fast the counterattack, they managed to get a 25 point lead, when averaged the quarter (67-42). The scoring went down during the second half of the set, but was UTE who could increase their lead and went on to take 31 on the end of the third quarter (79-48). In the last quarter the outcome was defined, it remained only to know what the end score was. The Local did not lowered their intensity and were able to stretch further differences to close the game with a 114-70 win.